Crytek are notorious for creating some of the best-looking games out there, and Crysis (released in 2007) is still used as a benchmark for PCs. It’s always assumed you needed a behemoth of a machine just to get their games to run, but that all changed with the release of Crysis 2. It was their first game to be fully optimised to run on this generation of consoles, and the result was one of the most beautiful console games ever made. 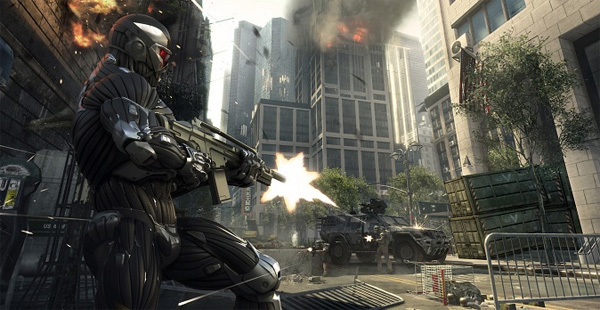 Crysis 2 is out in America already, and we’re getting ours on Friday here in the UK. It looks stunning, and many reviews are claiming it to be the best-looking console game ever. I’m quite gutted that its had to be dumbed down for them frankly, but theres no denying the game still looks fantastic. Paul and I have been preparing ourselves for it by revisiting the original Crysis, and the semi-sequel Warhead all this week, which I finally got around to finishing. It still looks gorgeous even after a few years. Click below to see the launch trailer for Crysis 2. It’s been 4 years since Crysis, the PC exclusive beast which became the graphical benchmark for all modern shooters. For a while we were waiting in anticipation of what Crytek’s next game would look like, expecting another leap forward in graphical deliciousness. Crysis 2 is now only a month away from release, and though it doesn’t appear to be as great a leap forward in the visual department as we expected, (lets thank the console toys for that) it still looks fantastic. See the new 3 minute story trailer below.